You have the option to buy the coat or return it (clean) at the end of season. 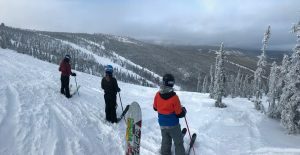 The FASC DEVO program is for skiers between the ages of 11 to 18. This program develops all-mountain skills through directed free-skiing, race drills, and gate training. It is designed to accommodate those skiers who are graduating from FASC Mighty Mites and aren’t ready to commit to the full Junior Program. The emphasis of the DEVO program is directed at building confidence and technique; athletes will split their time between directed free-skiing and drills with their coaches to learn the basics of race techniques. Racing opportunities include the Alaska U14/U12 State Championships and other local USSA races in Alaska. Skiers must attend 10 days of training with the team prior to traveling and entering in a divisional race.Travel to divisional races is at the coach’s discretion. Parents are responsible for all race fees, travel, including coach’s fees for travel. Membership in the US Ski and Snowboard Association (USSA) as an Alpine Youth or Competitor is required. Membership registration may be done online at www.ussa.org. Helmet. All U14’s and older must have a FIS RH 2013 helmet to participate at USSA scored and non-scored (club) races. No sticker no start.Athletes participating at USSA events must be using equipment that complies with USSA Rules. This program emphasizes the development of strong, fundamental skiing skills and the introduction of basic racing techniques. Athletes in this program train on Saturdays 12 to 3 pm at Ski Land from January through the end of March. ski for the duration training session (3 hours). 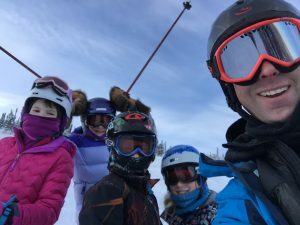 Parents are encouraged to ski with the Mighty Mites. Volunteers are always needed on race days, and parents are strongly encouraged to get involved by volunteering to help with registration, distribution and collection, gate keeping, timing, and course preparation. 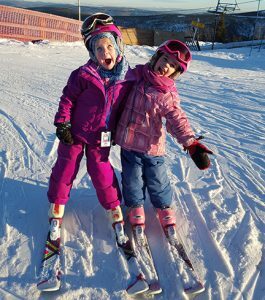 Parents are encouraged to allow for as much free-skiing opportunity as possible. The more time spent skiing, whether training or just out having fun, the better the skier! 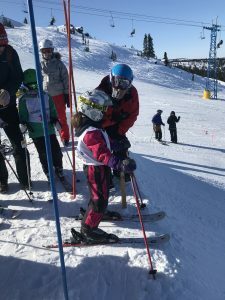 There will be opportunities in March for athletes in the Mighty Mites to travel to the Anchorage areas to participate in Youth Ski League races. These races are open to athlete’s age 6–14 years old and give young racers the opportunity to compete against skiers from other clubs. Skiers must attend 10 days of training with the team prior to traveling and entering in a divisional race. Travel to divisional races is at the coach’s discretion. Parents are responsible for all race fees and travel, including coaches’ fees for travel. Membership in the US Ski and Snowboard Association (USSA) as a Youth is required. Membership forms may be downloaded from the USSA website, or you can register online (http://www.ussa.org). Shaped skis, preferably a junior multi-event racing ski that can be used for both slalom and giant slalom. The type and size of ski is based on a combination of skier weight, height and ability. Bindings are important to the safety of the skier and should be appropriate to the type of ski and adjusted by a ski technician according to the size and ability of the skier. Boots that buckle in front. Rear-entry or mid-entry boots do not offer enough support. Boots should have four buckles, or three buckles for very young skiers. Avoid boots that are too stiff; junior race boots are designed specifically for younger racers and so have a soft race flex. Sizing is very important – too big and the skier won’t have proper support, too small and the boots will be uncomfortable and cold. Helmet. Skiers will not be permitted on the hill without a properly fitting ski helmet. Jacket that is warm without being too bulky. Warm mittens or gloves and a face mask.